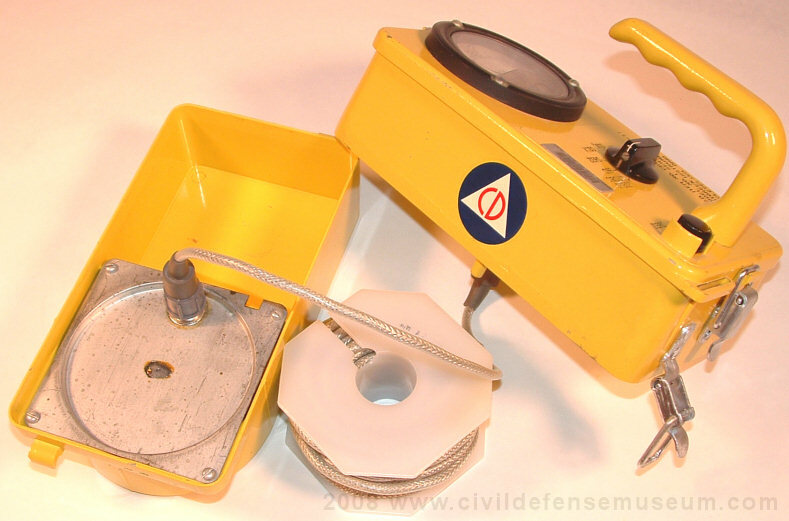 The CD V-717 was designed for use in fallout monitoring stations. The CD V-717 has the exact same operating characteristics as the CD V-715 but with an added feature. The CD V-717 has a removable bottom with a 25 foot extension cable. The detector element (ion-chamber) is mounted inside the removable bottom. This allows for the placement of the detector element outside of the shelter area while the metering section of the metering unit would remain inside of the shelter area connected to the detector with the 25 foot cable. The CD V-717 originally had to be specially requested in addition to the other instruments (CD V-700, CD V-715 etc) for issue to use in fallout monitoring stations. The yellow bag is to protect the case bottom from the weather when it is placed outside the shelter area. Victoreen was the only manufacturer of the CD V-717. Here is the CD V-717 opened up. The cable reel and detector element can be seen in the case bottom at the left in the picture. The center case assy. is at the center of the picture. The case top with metering circuitry at the top of the picture. 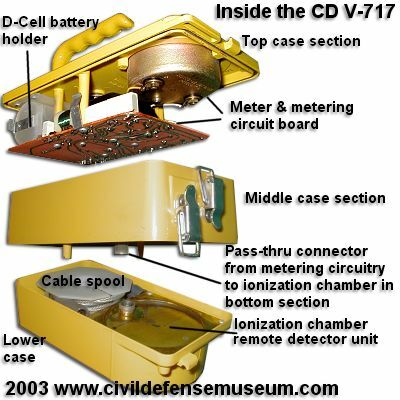 The CD V-717 operates on a single D-cell battery. CD V-717, remote sensor survey meter, is essentially and CD V-715 gamma survey meter with a removable detector unit for making remote measurements to distances of 25 feet. The ranges of this instrument is 0-0.5, 0-5, 0-50 and 0-500 r/hr. When properly calibrated, the response is within the range of plus or minus 20 percent of the true gamma dose rate from cobalt 60 or cesium 137 when the cable is connected for remote sensor use. The instrument response is within plus or minus 5 percent of the meter indication when the cable is not in the circuit. 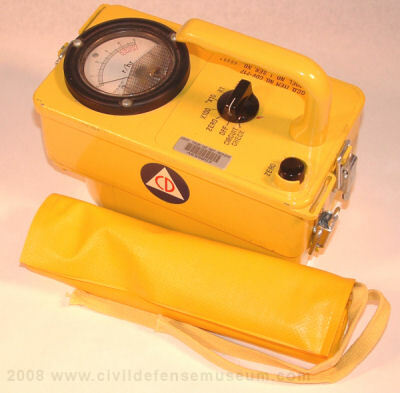 This instrument is for use by radiological monitors in monitoring stations during the early period following a nuclear attack. The instrument was designed to decrease the radiation exposure to the monitor by enabling to obtain outside dose rate readings while utilizing the protection of some portion of the structure. The metal-cased meter unit seen in these CD V-717 photos was the more durable ruggedized meter and can easily be indentified by the larger black frame around the face of the meter. I have a couple of CD V-715s with these metal-cased meters in them. I have seen mentions that these meters being more durable were also to reduce EMP (Electromagnetic Pulse) effects on the internal electronics of the instrument. I haven't found any information about the metal-cased meter's effect on EMP in any of the FEMA/Civil Defense documents that I have. The FEMA CPG 4-1 Volume 3 states that "The CD V-717-1 uses a ruggedized metal-cased meter to meet the instrument requirements for water-tightness, shock, and vibration resistance." The parts substitution chapter in FEMA CPG 4-1, Volume 10 states that "The metal cased meter used on the CD V-717 model 1 may be used to replace any CD V-715 or CD V-720 meter where a more durable meter is desired." This sounds to me like the CD V-717 was the only instrument originally equipped with the metal cased ruggedized meter.